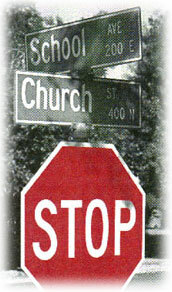 There’s a stop sign at the corner of Church and School, as well there should be. It wasn’t always there. People used to slow down at the intersection and keep an eye out for each other. But as traffic increased, some notable accidents occurred on this very corner. Lots of people got hurt, and word has it that some cars were even torn right in two. So awhile back they put up a stop sign at the corner, and the community hasn’t quite been the same since. Now some of the people who live on Church Street blame the people who live on School Street for the stop sign. They feel they are no longer welcome on School Street and have heard that there are people on School Street who think them unfit parents and want to undermine what they are teaching their children. And some who live on School Street raise an eyebrow of suspicion at those who live on Church Street. They’ve heard stories of those who want to take over their street, remove the stop sign and make it another Church Street. The strange thing is that the vast majority of people on School Street would never want to stand between parents and their children. And you can find precious few people on Church Street who want to take over School Street. But they don’t know that because their suspicions are so strong that when they do try to talk to each other it ends up in a shouting match where everyone walks away frustrated. No wonder there is so much tension in this community. It is just a stop sign after all, not a barricade. It was meant to help protect the community, not destroy it. There are people now meeting at the corner of Church and School and finding that there is enough common ground to work together instead of pulling apart. Wouldn’t you like to join us? Resolving disputes over issues with religious overtones has seemed like a no-win situation to many educators. The prevailing wisdom said either to ignore them citing separation of church and state, or to placate the latest complaint and hope people on the other side don’t find out about it. Fortunately today Supreme Court decisions, legislation and ground-breaking initiatives by the First Amendment Center at Vanderbilt University have rendered both of those tactics obsolete. These have provided clarity about religious neutrality in public education that can help diverse constituencies find common ground to seek cooperative solutions to some of society’s most difficult issues. Many districts have trained their staff, educated their communities and designed common ground policies that demonstrate how religious neutrality in public education can benefit all students. The Supreme Court has consistently ruled that minors in a public school environment cannot be indoctrinated into any religious faith. But it also makes clear that neither can the public school seek to diminish or undermine that religious faith. The hope of American democracy is that one does not have to be less Christian, less Jewish, less an atheist or less anything else to participate in society. Learning how to do that will benefit every community, and will help school boards and administrators turn much of the dissent in their community into constructive dialogue that strengthens the district and the community. Never has their been a greater opportunity to engage the entire parent community as full partners in the process of education. district the time and pain of unnecessary conflict! 1. Don’t take religious conflict personally. For the past three decades a convergence of historical forces has caused us to redefine the role of religion in public life. No one foresaw how these issues would be resolved and no national effort has helped the public understand why these changes help us all. 2. Train at least part of your staff in common ground thinking. Learning how to engage people on both sides of the religion and education debate is critical to containing conflict and finding mutual beneficial solutions. 3. Educate the community through public forums or Common Ground task forces that recommend policies and curriculum choices that promote fairness to all in your district. Religious neutrality is good for everyone. 4. Don’t bury religious conflict. Where it surfaces help facilitate a community dialogue to resolve the issues consistent with Constitutional mandates and educate the community in the process. 5. Build bridges to the to faith communities, as you would other constituencies in your city. Cooperation with churches, synagogues and mosques can provide valuable resources, as long as everyone on campus appreciates the religious-neutral environment. 6. Keep informed. Religious Concerns Watch is a free service, provided by BridgeBuilders via email. It is a monthly update on court cases, legislation and ideas for building greater understanding between educators and people of faith. BridgeBuilders utilizes its own materials as well as those from the First Amendment Center at Vanderbilt University and strongly encourages school districts to consider their 3 R’s Curriculum and to support the projects they have begun in many states to help build common ground. Depending on the needs of your district BridgeBuilders can provide training, mediation or strategic planning that can help you make the peace and work constructively with various parent groups.